The City of Toronto is looking at ways to improve commercial shipping and freight transportation in the Finch West area of Toronto. The City is developing the Finch West Goods Movement Transportation Master Plan (TMP) to consider the LRT related changes, as well as to recommend other opportunities to provide for safe, efficient, and effective transportation of freight in the area. The study area is bounded by Dufferin Street and Islington Avenue (east-west), and Highways 407 and 401 (north-south). This includes the Emery Village and Duke Heights Business Improvement Areas (BIAs). In late 2014, a Truck Technical Working Group was established as part of the Finch West LRT stakeholder engagement consisting of the Emery Village (BIA), the Canadian Fuels Association (CFA) and others. This group met on four occasions and arrived at a consensus to conduct an area-wide transportation study to examine freight-related solutions. Additionally, a number of other initiatives have also identified potential improvements in the area. 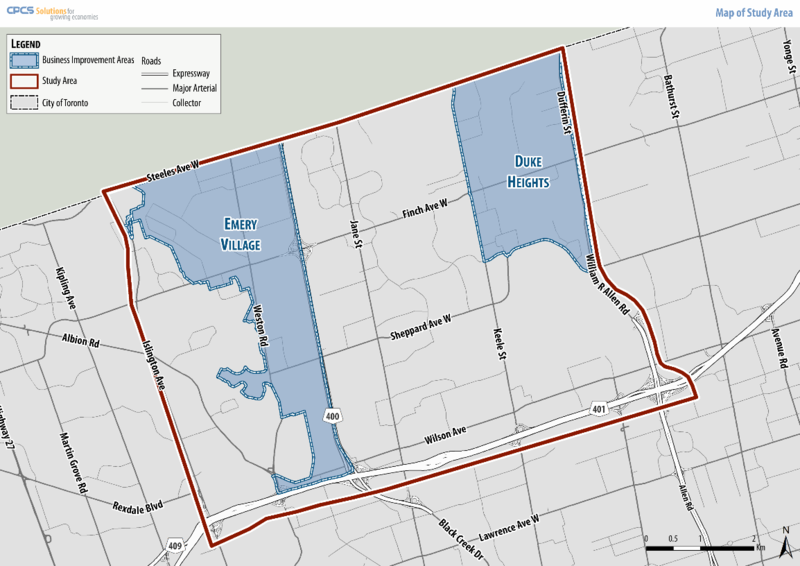 This includes the Downsview Area Transportation Master Plan (2016), the Downsview Area Secondary Plan (2010), the Emery Village Transportation Master Plan (2009), and the Emery Village Secondary Plan (2001), among others. This Goods Movement TMP is being prepared in accordance with the Municipal Class Environmental Assessment (EA) process. The study will identify and prioritize short-term (“quick win” 0-3 years), medium-term (5+ years), and long-term (10+ years) improvements to the transportation network. A Stakeholder Workshop was held with local businesses on April 11, 2019. Public consultation will be conducted in the coming months. Contact us to be added to the project email list to receive notice.